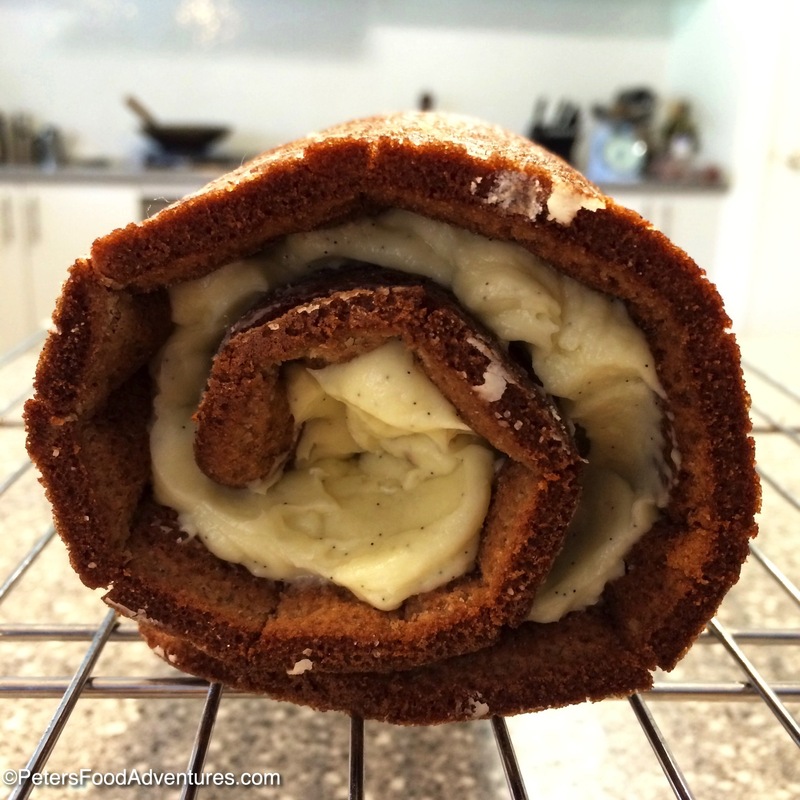 This Classic Pumpkin Roll with Vanilla Bean Cream Cheese is easier to make than it looks. It reminds me that it’s almost Thanksgiving time and the countdown to Christmas has begun! It’s like a Pumpkin Swiss Roll or Roulade made with Pumpkin Pie Spice, generously slathered with vanilla bean cream cheese. It’s funny, moving down to the southern hemisphere where the seasons are upside down, has mixed me up when it comes to holidays. It’s currently springtime, flowers are blooming, the kids have just started swimming in the pool for the first time since winter, and it’s time to prepare for the Northern hemisphere wintery holidays like Thanksgiving and Christmas. Nothing screams holiday time for me better than Pumpkin Pie and the spices used to create the smell of Thanksgiving and Christmas. Pumpkin Pie Spice is super easy to make if you can’t find it. Australia also doesn’t easily sell canned pureed pumpkin, so I had to puree my own pumpkin. It was super easy, peel and cube about 500g of pumpkin, boil for 25 minutes, drain and puree for about 1 cup of pumpkin. Easy and no need to panic over lack of ingredients. For a proper homemade pumpkin puree recipe, check out this tasty site from the Belgian Foodie. I love using real vanilla bean when I can, but it can be pricey to use all the time. I buy a vanilla bean paste in a small jar, where 1 teaspoon equals 1 vanilla pod, which is perfect for adding a deeper vanilla flavour to your dessert. As I mentioned, I absolutely love this dessert, Classic Pumpkin Roll is an autumn dessert winner. The rolling of the cake sounds harder than it is, but if you follow these instructions step by step you can’t go wrong. And like I said, you’ll need to make this recipe twice, once for you to eat and another for your guests. Bon Appetit! Приятного аппетита! Pumpkin Roll is the perfect holiday treat for Thanksgiving or Christmas! It's like a Pumpkin Swiss Roll or Roulade made with Pumpkin Pie Spice, generously slathered with vanilla bean cream cheese. Preheat oven to 190°/375°F and grease and flour a 9x13 inch jelly roll pan or a cookie sheet. In a bowl, mix together the flour, sugar, baking soda and the pumpkin pie spice. Add in the pumpkin puree, eggs and lemon juice. Pour it into the prepared pan, ensuring that the thickness is even across the pan. Bake for 15 minutes, until it is golden brown and springs back when touched lightly. While cake is baking, prepare a clean damp tea towel by sprinkling 1/4 cup of icing sugar across the towel. When the cake is baked, turn the cake upside down on the damp prepared tea towel. Carefully roll up the towel with the cake inside into a roll and place on a baking rack to cool (about 30 minutes or until completely cool). Using a mixer, beat together the cream cheese, butter, icing sugar and vanilla bean from a single vanilla pod, cut in half and scraped. When the cake has cooled, carefully unroll the cake and spread the vanilla bean cream cheese evenly across the cake. Make sure there is cream cheese in the starting curl, as this is the middle of our cake. Immediately re-roll the cake, without the towel and cover with cling wrap and refrigerate until you are ready to use. When you are ready to serve, Dust with icing sugar and slice to your desired thickness. Enjoy! Looks yummy and very pretty! This look amazing!! I love pumpkin roll, and the vanilla bean sounds delicious! Lobe Vanilla Bean for cakes and desserts. This roll recipe is gorgeous! Thank you. It’s a good one! Wow looks so yumm…lovely presentation.. ???????????? Looks and sounds wonderful, Peter! Beautiful! I love the flavor combination of pumpkin and cream cheese… yum! My daughter and I were just talking about Christmas in Australia. It’s very hard for us to imagine hanging out on the beach on December 25th, or listening to “White Christmas” poolside. ???? Yes, the flavours go so well together! ???? Christmas in Australia felt funny the first year, but we have a great Xmas spirit here. You’re still allowed to say Merry Christmas here, it’s everywhere! Some ways I think it’s better because people try harder for Christmas, oh, and because it’s so hot, turkey dinner is often replaced with cold seafood, like prawns and lobsters. Yum! Yum is right! My husband is of Italian descent, so we do the Feast of the Seven Fishes on Christmas Eve… with all the different seafood, I think I actually like that meal better than Christmas dinner! ???? that sounds delicious, and love the name too! I love this Peter! Wow time for swimming, it is 40 degrees over here! Thanks Lynn! ???? 40 degrees!!! Yikes! Haha! Ice cubes in the pool??? The hottest I’ve ever been here is 46 degrees Celcius on Boxing Day, our first Xmas here, so hot! I’m curious about the use of “confectioner’s sugar” in the cake recipe, yet you call it icing sugar in the icing part… did you actually mean granulated sugar? I don’t want to mess it up before i’ve even begun! Great question Janinie! I meant icing sugar, which is the same thing as confectioners. I have changed it all to icing sugar so it’s consistent. Thanks for catching it!